So, um, I have this band called Leopard Print Tank Top and we had a really great gig tonight that made me realize that I should tell you all about it so that I can feel like it's a real thing that I'm doing. 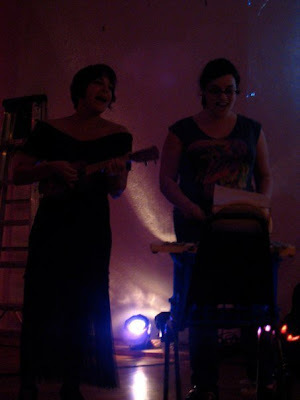 I play the glochenspiel, sing and play whatever other instruments are lying around. Elisabeth, who I've been singing with since I was five years old, sings and plays the ukulele. Our friend Joie belly dances. Leopard Print Tank Top is a San Francisco based trio that proudly embraces the ridiculous. 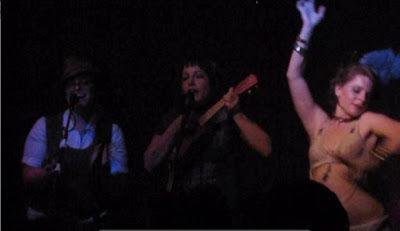 LPTT's quirky instrumentation of ukulele and glockenspiel combine with vocal harmony, belly-dance and lighthearted theatrics. Their playful approach to performance is beautiful, mesmerizing, and utterly silly. So the first step in becoming official is that I MADE A FAN PAGE ON FACEBOOK! Please "fan" us if you want to hear about upcoming gigs and whatever else bands do on that there web thingie. We write our own stuff mostly: "Lullabye" sounds like something out of Coraline or Amelie, "Lovership" is about wanting a relationship both ways, "Boobies" is, well, about boobies. We also just wrote a song called "Missed Connections" inspired by craigslist. It's fun. The best parts? I get to make music with my friends, we make people laugh and the boys love us. What more could a girl ask for? We'll see where this goes!